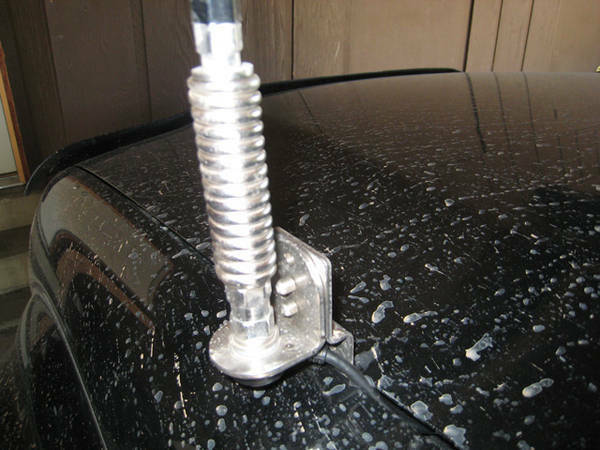 CB Antenna Hood Mount for 2nd gen? Discussion in 'Audio & Video' started by Chickenmunga, Oct 19, 2010. I'm looking for a CB antenna hood mount for my truck. My local shop sold me one of these, which is designed for a T100 and won't work. Is there anyone who makes one for a 2nd gen? I saw this but I don't know of anyone who's tried it. I have the universal hood mount on my 1st gen. Works great. Right Channel Radios is an awesome company to do business with BTW. I really don't mean to sound rude with this comment, but a 1st gen hoodline is not a 2nd gen hoodline. That's why there's a mount sitting in my house that a guy said "is specifically designed for toyota hoodlines"... just not my hoodline I hope you understand the predicament. The one I have is too short.... aaand I don't have a torch. I just saw that Right Channel posted dimensions that I missed last time around. I'm headed to the garage with a tape measure. It's not surprising that the T100 mount doesn't fit. You'll need a universal. Both the Firestik deep channel and universal adjustable should fit. It's been a while since I looked at a 2nd gen but somehow I doubt their hood channels are any deeper than 2". If for some odd reason they are deeper then just add some shims and you'll be good to go. The hood channel is 1 3/4" deep, the universal mount can handle up to 2". Also, a word of advice. If you have a fiberglass antenna I'd stay away from medium strength springs. I had one to start out with and the antenna would damn near slam into the cab on the highway. Just a wee bit too much give. 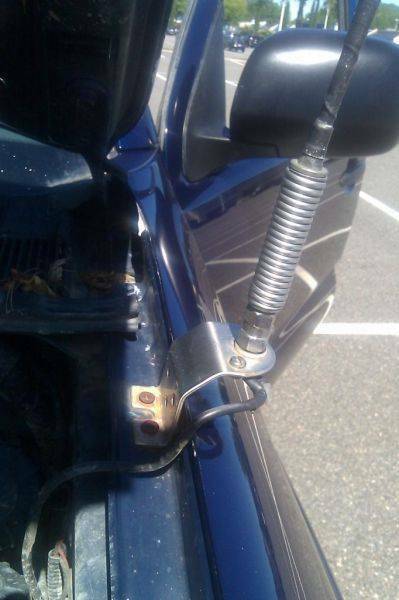 The HD strength springs work way better with just the right amount of give when I hit tree branches and stuff. I have a Wilson Flex-4, I don't think there was any spring needed... I can bend it into a U-shape by hand, so it's got some pretty good give. Would you consider that too much? Might have some issues with your SWR with that antenna. I'm more of a fan of Firestik. Got mine 1:1 in a couple minutes of tuning. Even with a flex antenna I'd still suggest a spring. It'll protect your mount. What mount is that? I looked again at my channel, and there's a funny lip on the inside so I might have to do some bending if I got a universal. Uggghhh. I'm not sure I understand. Is it that the antenna flexing puts too much strain on the mount or...? Not sure what u call mine..had it for years...was on my 1st gen too. I did have to flat-in out where u see the 3 wholes...hammer and block did the trick....pretty sure I picked it up at a CB shop. Its a bomb-proof mount that will hold any antenna (when installed properly) and gives absolute best performance from your radio/antenna combination. I made this one for a ham radio antenna. much cleaner looking then those generic hood ones and no drilling. 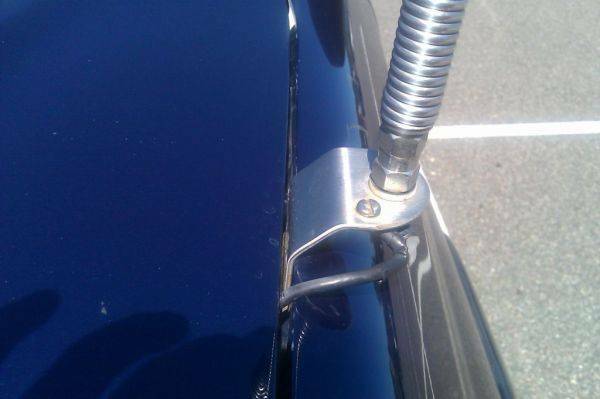 I'm sure it would work for a CB antenna as well. I think that would drive me nuts with it being in front of me, plus the antenna would smack the truck body I would assume. Yeah, that's a bit more drilling than I'd like to do. Not sure about CB antennas, but never had a problem with the ham antenna. could even open the hood all the way without removing the antenna. 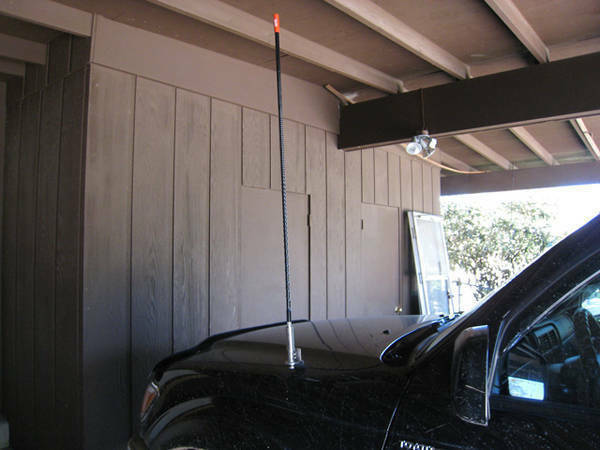 I also have one of PreRunnerSeth's customer mounts for my HAM antenna. With the angle that it is at I am able to open the hood without any issues. The antenna seemed like it would be in the way, but is really not that noticeable. It is probably something you get used to, but it has never been an issue for me.